Master of Malt may be best known as a multi-award-winning spirits retailer, but all that may be about to change as we reveal our plans to use cutting-edge additive processes to build a state-of-the-art whisky distillery and produce truly innovative new whiskies. Happy Easter everyone! Or International Egg Day, if you’d prefer! This is a plan that’s snowballed from humble beginnings. We’ve always been interested in the potential of additive processes, whereby instead of having to remove bits you don’t want, you only use what’s needed. As well as being far less wasteful, using this kind of manufacture appropriately can also provide significant cost savings. Naturally, we were early adopters of 3D printing and once everyone in the business had at least five amusing little 3D-printed models on their desks we eventually got around to prototyping new product designs. It wasn’t long, however, before we realised just how many other practical uses there were. We printed coat hooks, replacement knobs for drawers and cupboards, and even protective phone cases for all our amazing staff! Printing a required part for our warehouse’s roller doors rather than waiting for a replacement was another particularly pleasing example. Sure, we were spending hours designing and printing stuff, but it was fun, made us more self-sufficient and meant we didn’t have to keep spares lying around. What’s more, we’re now able to recycle most old parts once they’ve been washed and shredded, so it’s basically a closed loop process. Of course, we aren’t the only people in the drinks industry to have shown some interest in 3D printing. Back in 2013 Joel Harrison and Neil Ridley released a blended malt with the world’s first downloadable bottle packaging, and portended far greater uses for additive technologies in the future. In 2015, Ballantine’s gifted the world a solution to an age old problem: how do you drink whisky in a zero gravity environment? Their space glass was constructed using 3D printed plastic and rose gold components. A year later Print A Drink appeared, following work at the University of Arts and Design Linz’s laboratory for creative robotics. Their machines, designed for bars, have the ability to inject edible microlitre drops into cocktails to build all manner of complex patterns and geometric structures within your freshly made serve. Throughout all this we continued to develop our own interests. We were checking out the smartest available machinery and their increasing scale and industrial applications, keeping up with fast-paced developments in fashionable (but occasionally disappointing) new metallic filaments. We learned everything we could about classic stereolithography and the latest rapid liquid printing techniques, and built a new sub-department dedicated to additive technologies. Initially, the department sat between our procurement and maintenance functions, but its remit to seek out new and imaginative ways to cut costs and waste continued to grow with impressive results. This was taken to the next level when Avi Pernrit came on board in early 2014. Avi opened our eyes not only to the seemingly sci-fi levels of sophistication already possible at the cutting edge, but also brought with him a working knowledge of the newly emerging 4D printing technologies being developed at the Massachusetts Institute of Technology (MIT) and elsewhere. These had been brought to the attention of the wider technology and design world during the preceding months by the likes of Skylar Tibbits, but again we were amazed by the short to medium term potential. 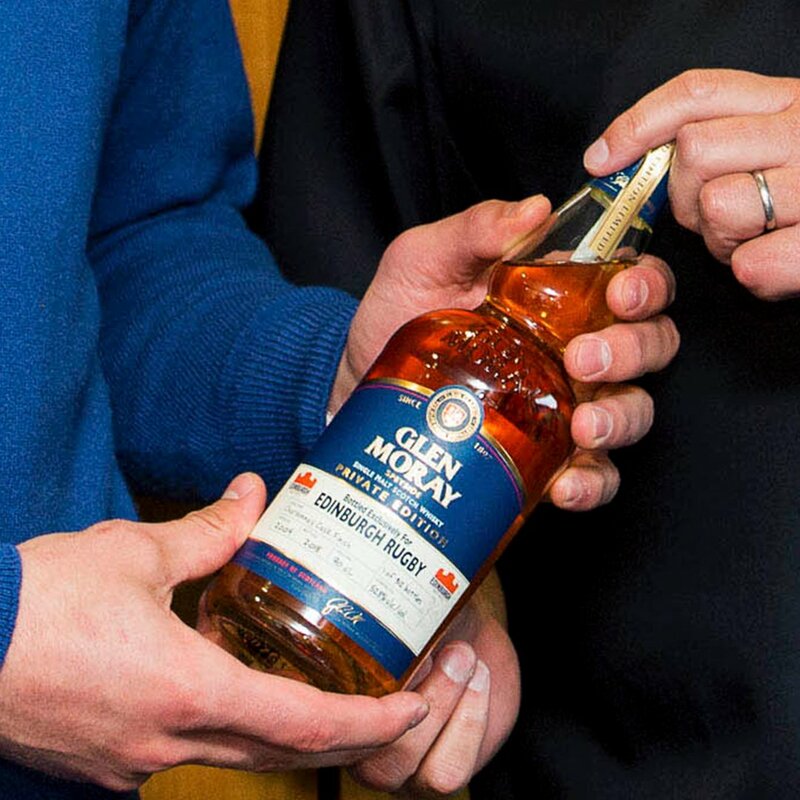 It wasn’t long before we determined to bring the worlds of additive manufacturing (AM) and whisky production together. Seeing that through to fruition has involved an enormous amount of focus, hard work, experimentation and development as well as collaborations with some of the brightest and best figures in the field to find very specific, niche technological solutions. Having pooled our collective whisky knowledge and quizzed dozens of master distillers, blenders and coopers (as far as we dared without revealing the full details of our plans), it was clear that further scientific expertise would be required. Highly accomplished chemist and drinks enthusiast Dr. Laurie Lennox joined the team prior to Christmas 2015, but throughout 2016 we still kept the project under wraps. Despite more than encouraging progress, everything remained largely academic and theoretical at that stage, with real hurdles yet to be overcome. When the day came that the final pieces fell into place and it dawned on us that the whole thing really was going to be possible, it was one of those genuine eureka moments. So, 3D printing a building. That’s madness, right? Well, actually, no. There are companies out there printing houses in situ in 24 hours these days. We recommend following the link in the previous sentence and checking it out, it’s cool as hell! When you consider it’s been achieved without moving the mechanical arm from a single pivot point, nor allowing for the incorporation of more complex separately or contemporaneously printed elements, you may start to see that almost anything is possible. In fact, construction 3D printing (C3DP) is well established. Using a mobile, computer-controlled crane arm, this is essentially basic 3D printing scaled up. The European Space Agency and NASA each announced plans to print bases on the moon as far back as 2012, for example! For our project we’ve chosen a combination of reclaimed and refined construction materials, and quick-drying cement for a foundations-up construction next month. It’s due to be completed within four days. Naturally, the stills were on all our minds. So much so that we spent several months… let’s say ‘enthusiastically deliberating’ over different designs. To boil ball or not to boil ball? A nice onion shape? What about garlic? Exaggerated Cygnus nape? Appended optional pillar maze?! The discussions would go on late into the night. We’re not big on compromise (more on that later), but the solution was staring us in the face: don’t. Having at least narrowed the concepts down to a selection that reflected elements of all our favourite distilleries, we simply decided to choose all of them. We see it as our take on a more Japanese approach with various shapes and sizes of still and angles of lyne arm able to produce a wide variety of styles. We’re even considering installing a 19th century Dublin-style behemoth in the corner. We have plenty of room. The fourth dimension here is time. To understand 4D printing you don’t need to get your head around Minkowski spacetime, though. 4D printing is essentially 3D printing something that can then change at a later time when exposed to specific predetermined stimuli such as heat or light. Submersion in water was another favourite in early 4D printing experiments. Each of our stills will be fitted with a fail-safe 4D-printed valve that will stop liquid escaping the still if we start to boil over. Comforting. Going forward, we’re committed to using worm tub condensers for the majority of our distillation, and even hope to be able to control flow and copper contact by using adaptive worm pipework that can expand and contract. You may be thinking all this sounds thrilling, but there aren’t many applications here for good ol’ maturation… Following a couple of years of iterative trials, however, we humbly disagree. This was one of the trickiest print jobs to crack, and is one of the parts of the project that’s had the most time poured into it. Just a few months back we were still working on some potential long-term warping issues, having previously wrestled extensively with seasoning period replication. Casks may have been one of the most difficult aspects, but it’s also been one of the most rewarding. The start point here was being able to successfully build layers during printing that would accurately mirror the quarter-sawn structure of traditional staves using a cutting-edge biomass of ground wood and a bare minimum of barley starch polylactic acid (PLA). The massive bonus, of course, is that we’re able to use every part of the available timber in the process, so there’s far less waste. Win. 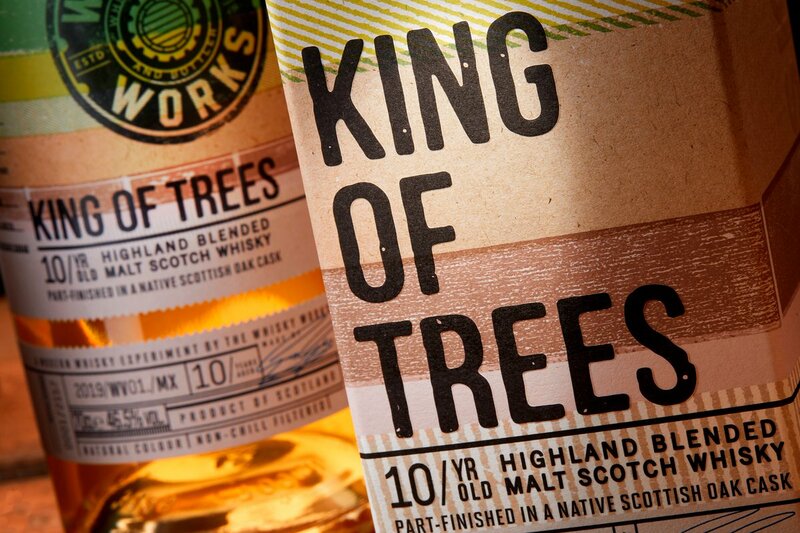 Other options this has naturally opened up to us is the ability to print casks that are truly hybrid, with their entire structure made up of any proportion of sustainable Quercus robur, Quercus petraea, Quercus alba or even Quercus crispula that we specify. We can even add in a percentage of cedar or birch, or any combination you can think of. Last but not least, we can print them all whole on-site. We have no plans to print an ex-Tequila-style cask at this time. As featured in our reveal video, all these innovations are incredibly exciting, but they’re not the end goal here. Once we’ve built up our inventory of aged stocks over the next decade and well beyond, we’ll have the raw materials required for the final, nano-level stage of our whisky production. As consumers we compromise all the time, which, as mentioned, isn’t something we’re terribly keen on. It’s certainly not what we want for you, our wonderful customers. Well, what if you didn’t have to compromise…? Take this classic quandary, for example: should you purchase a bottle of peated or unpeated single malt? Perhaps you love both? Perhaps you strongly prefer one over the other, but still like to mix it up from time to time? What if your guests’ tastes don’t match your own? What a minefield! The solution may be just on the horizon. We’ve been conducting a wide range of experiments in the Master of Malt lab using an array of popular whiskies to create brand new programmable spirits. One of the most popular at MoM Towers has been Test No. 764, which has the character of an unpeated whisky until you expose it to a specific amount of heat. Under those conditions it will become increasing phenolic. Brilliant, eh? Naturally, we’ve already trademarked the name ‘No Smoke Without Fire Whisky’. We’ve experimented extensively with a whole range of transformation triggers including chemical and sonic stimuli. In hindsight, though, programming whiskies to change upon exposure to frequencies prevalent in jams by golden age hip-hop pioneers may have been a mistake. After the third incident, we had to remove all the speakers from the vicinity of the control sample storage area. That aside, the good work continues apace. By the time our first release hits the shelves we may have already reached the point where it will be possible to transform a single whisky into any style imaginable. For example, to get from a classic fruity Speyside to an oily, Mizunara and American oak ex-Fino cask finished, lightly peated style you may have to simply shine a UV light on your tasting glass for 5 minutes (having lined it up with magnetic north), play it the Bolero of Fire from Ocarina of Time on a wind instrument of your choice, chill it down to -7°C and then threaten to mix it with Hubba Bubba soda and not even drink it if it doesn’t do what you want. Easy really. In fact our resident lawm’n Joel did this under test conditions while solving a 4×4 Rubik’s cube (i.e. the Rubik’s Revenge) just the other day. It truly pains us to make you wait for years before you can truly enjoy and interact with these extraordinary 4D whiskies from our very own Master of Malt distillery, itself built using cutting-edge additive manufacturing techniques. Sadly we also can’t currently release the liquids from our in-house trials, but they can still be experienced digitally through an old piece of tech we brought to market back in 2014: the multi-sensory Joculus Snift eDramming headset. Thank you for this brilliant and fun article! Happy April 1st. Chris Morris would be proud!